Hacked: LifeLock CEO spanked by identity thieves … 13 times. Let’s end “hacked” week with one from the “you can’t make this stuff” file. LifeLock is one of the companies that monitors the credit applications and credit worthiness inquires. Todd Davis became LifeLock’s CEO when the company’s founder was ousted for making repeated misleading statements about his shady past and the company’s origins. For a couple of years, Mr. Davis was prominent in LifeLock’s ads … revealing his social security number and daring identity thieves to crack his code. Reportedly, Mr. Davis has had his identity stolen at least 13 times since his taunt-the-thieves commercials. 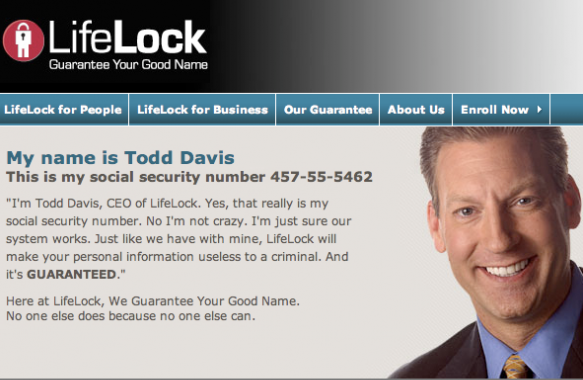 LifeLock CEO Todd Davis, whose number is displayed in the company’s ubiquitous advertisements, has by now learned that lesson. He’s been a victim of identity theft at least 13 times. In June 2007, Davis was the victim of identity theft when someone used his identity to obtain a $500 loan from a check-cashing company. Davis discovered the crime only after the company called his wife’s cellphone to recover the unpaid debt. About four months later, Davis’ identity was stolen again by someone in Albany, Georgia, who opened an AT&T/Cingular wireless account using his Social Security number. The perpetrator racked up $2,390 in charges on the account, which remained unpaid. Davis only learned a year later that his identity had been stolen again after AT&T handed off the debt to a collection agency and a note appeared on his credit report. Reportedly, Mr. Davis is being dogged by at least five collection agencies . To add insult to injury, LifeLock got slapped with a #12 million fine by the Federal Trade Commission for deceptive advertising …. since the service didn’t really stop identity thieves from feasting on Mr. Davis’ social security number. You can read this one a couple of different ways. Resist the “see, it doesn’t work” interpretation. The dufass did lay the info out in public and dared the bad guys to take a whack. So, “only 13 times” probably isn’t bad. Rather, accept that identity theft can happen to anybody … even the CEO of LifeLock. I’m glad that I had my ID guard subscription in place this summer to get the alerts. The mess would have been worse if things had gone unchecked for a couple of months. At least I was able to nip this rash of fraud attempts in the bud. P.S. I don’t use LifeLock because it’s more expensive than other services that provide essentially the same services. I figure that LifeLock is just charging more to fund its goofy ad campaigns. This entry was posted on August 2, 2013 at 6:59 am and is filed under Credit Cards, Credit fraud, Fraud, Identity Fraud. You can follow any responses to this entry through the RSS 2.0 feed. You can leave a response, or trackback from your own site.